Some of the major companies in cancer drugs market comprise GlaxoSmithKline, Bayer, Sanofi, Novartis, Amgen, Pfizer, Bristol-Myers Squibb, Merck, Ariad Pharmaceuticals, Celgene Corporation, Hoffmann-La Roche Ltd, Eli Lilly, Johnson and Johnson, Boehringer Ingelheim GmbH, and Teva Pharmaceuticals among others. These players are ready to place the cancer drugs market on new heights. As per analysts at Zion Market Research, the global cancer drugs market was capitalized at almost USD 112.90 Billion in 2015 and is anticipated to create income of almost USD 161.30 Billion by 2021, developing at a CAGR of almost 7.4% from 2016 to 2021. 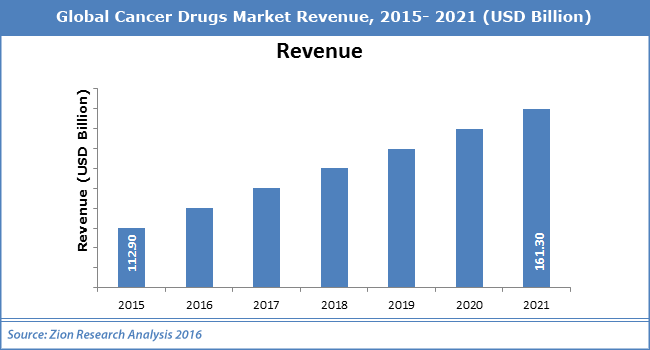 “Global cancer drugs market is majorly boosted by increasing cases of target disease such as breast cancer, lung cancer, and cervical cancer all over the globe,” as per analysts at Zion Market Research. Other major boosting factors are growing research and development on targeted & biological drug treatments for the cure of cancer. On the other hand, stringent regulatory policies and the high cost of drug development paired along with the potential of failure are the primary limitations that might hinder the development of the cancer drugs market. Europe, North America, Latin America, Asia-Pacific, and the Middle East & Africa are major regional sections in the global cancer drugs market. North America is likely to stay the dominating area in the years to come. Requirement for cancer drugs was uppermost in North America particularly in the U.S. Therefore, Asia Pacific is likely to be the moderate developing area in cancer drugs market in the years to come. In addition to this, the Latin America and Middle East & Africa are also likely to display moderate development for cancer drugs market in the coming years.